I work in the Monterey Bay real estate market. I have become aware from a victim of a new type of burglary. 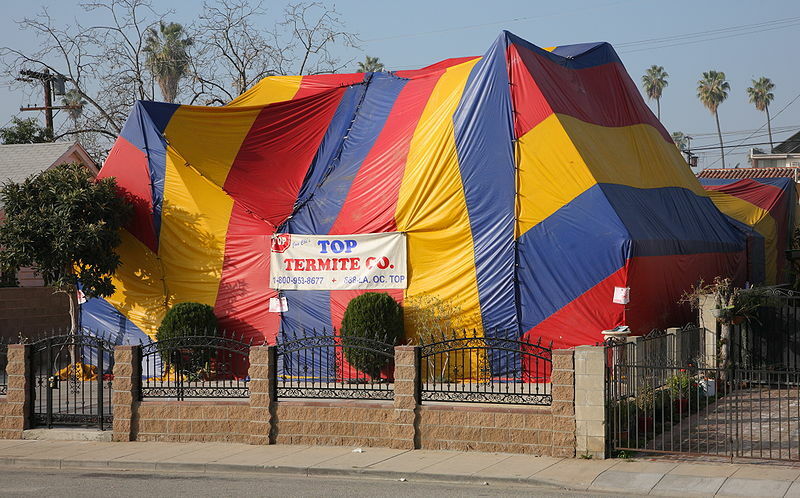 When a home is tented for termites one has to vacate, poisonous gas is set off in the house and a big tent is draped over the house for several days. I've learned that burglars are now attacking homes when they are most vulnerable. When the tent is on, the burglars have been cutting through the tenting or unclamping the seams and entering the house and ransacking it. It appears they would be wearing gas masks and using flashlights. As this tent is on for several days, it might be that the burglars are long gone before you get there and find your life and house has been turned upside down. What can you do to prevent your home from being burglarized? When a home is fumigated, it is done by licensed pest control operators. They have the utility company turn off the gas to the house, then tent it. After the home is sealed, they set up cannisters that release the gas. When the allotted time 2-3 days often is up, they take the tent off ,then test for residual gas. If there is any, they open windows to allow the fumes to evacuate. (1) Seal off the little critters from even accessing the cozy interior of your home in the first place by sealing off all door and window cracks using caulking, glue, putty or plaster. Even petroleum jelly will work as a temporary sealant. (2) Mix some liquid dish detergent with water in a spray bottle. If you see even one scout ant on your kitchen countertop, spray it quickly with a blast from this bottle and they will never be able to report back to the troops. (3) Place a thin quarter-inch unbroken line of powdered charcoal, cinnamon, citrus oil, baby powder or cayenne pepper inside door jams and window sills to serve as a barrier that ants won't cross. (4) Clean your floors, tabletops and countertops with a solution of water and vinegar, removing any previous ant scent trails. (5) At any place you notice ants entering your household, sprinkle crushed mint leaves, garlic salt, bay leaves or crushed cloves. Ants can't tolerate these odors. (6) Keep all food items in closed containers. Be meticulous about wiping crumbs and other food droppings from tabletops, countertops and flooring because these can quickly attract ants.